Today's lesson: "Take responsibility for your actions and always be considerate of others." 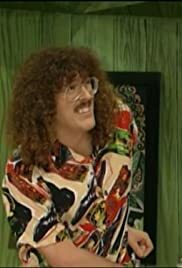 Weird Al fobs off his responsibilities for maintaining his cave on his poor Cousin Corky, who has better things to do. Then he decides to let her run the whole show while he goes to Hawaii to get his shoulders rubbed by Daisy Fuentes. Because of his desertion, Harvey the Wonder Hamster is in danger from Varna the Squirmese cook. Meanwhile, Fatman and Harvey the Wonder Hamster fight space fish who steal bagels from delis because bagels are what space fish use for money on their planet. Bobby the Inquisitive Boy sees a black and white educational film called "Learning About Your Nose." Speaking of nose, Fabio signs his name on Corky's nostril. What's on Al TV? An anchorman considers the public to be a pack of fools. A commercial asks, "Got lard?" A new disaster movie is called "60% Chance of Rain." Like episode seven, episode eight spotlights the charming Danielle Weeks as Cousin Corky, which, along with a few funny things on Al TV, helps make this an above-average episode.